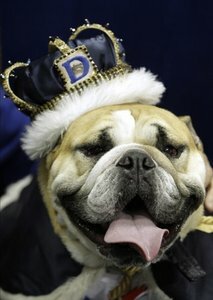 Bulldog Lucy Brown of DES MOINES, Iowa has been crowned as the most “Beautiful Bulldog”. Lucy Brown’s slobber, sloth and bloodshot eyes helped the precocious pup grab the greatest crown a drooling canine can ever dream of. Looks like it is a dream came true for the dog. The 3-year-old from Johnston, with a squat stance and slobber to spare, bested 49 dogs Monday to be named this year’s “Beautiful Bulldog” for the Drake Relays in Iowa. Lucy Brown will make a series of public appearances and serve as the mascot for the 102nd Drake Relays, the prestigious track and field meet that starts Thursday at Drake Stadium. Lucy Brown will take over for last year’s winner, Meatball, who made one final appearance with the crown Monday. He took advantage of his new-found freedom, too, barking as loud as he could at a mascot promoting a local bank. Aaron Brown doesn’t seem to think Lucy will cause a ruckus like that anytime soon. In fact, getting Lucy Brown out of the house might be the biggest challenge of her yearlong reign. Nancy Brown’s son Aaron Brown said, “All she does is sleep”. Next: Young Lasith Malinga pic!